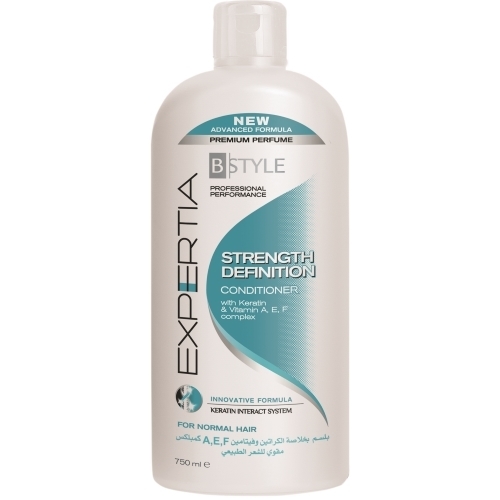 B-STYLE STRENGTHEN CONDITIONER 750ML – HAIRDEPOT - Hair & Scalp Care Products, Prevent Hair Loss, Shampoo, Conditioner, Treatment, Styling, Appliances and more! The formula of the Strength Defination conditioner is based on the beneficial properties of the Keratin amino acids, which help keep and restore hair&apos;s natural balance and healthy look. The Vitamin A, E, F complex, known for its anti oxidant and tonic action, in conjunction with reinforced conditioning agents contained, give hair a unique appearence that radiated with health, shine and vitality. Detangles and makes hair easy to comb without overburdening it.